Let's get our 5th-year anniversary started with the mangaka that begin it all, Bisco Hatori! Yes, before we limited ourselves to unlicensed content, I started scanlating "Ouran High School Host Club". That seems so long ago! Thanks to everyone for being patience while we completed projects and while I dealt with some tough real-life issues. Hopefully real life will stay stable for me so we can keep moving and introducing you all to some new artists and exposing you all to the cutting edge of shoujo and josei. As with any anniversary post, I would like to thank all past and present Omari's Sister and Crimson Flower volunteers. You all are more than I ever asked for or deserve. Seriously, the quality of work the volunteers output is amazing! I feel blessed to have such a talented team. All right, now, let's get to the actual release. This oneshot is from Ane Lala, a magazine that is advertised as "shoujo for women". Like it promises, the works in this magazine straddle the line between shoujo and josei. Most of the works involve working young ladies making their way in the world, but there are also a few historical and high school girl stories. 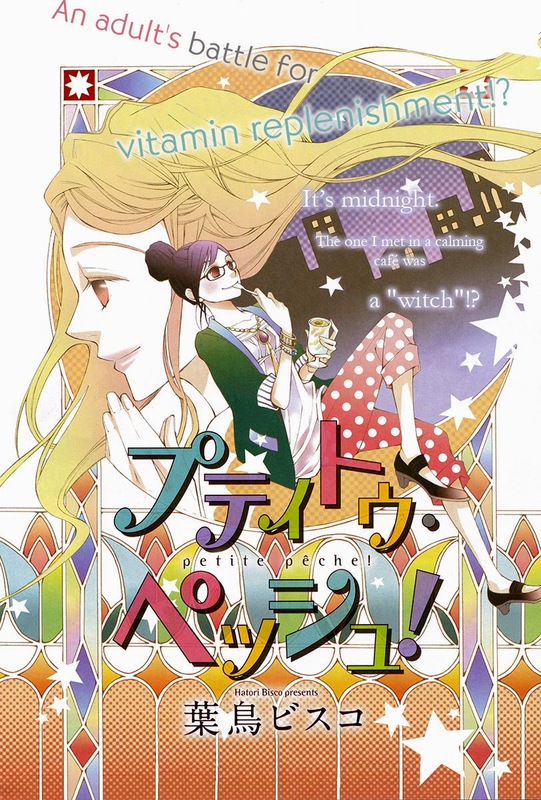 Petite Peche is nothing like "Ouran High School Host Club", but it's still very Bisco Hatori. It follows the recent trend of food in shoujo and josei manga. I would LOVE for this oneshot to expand into a series, and given that there is a second story, which we will release tomorrow, I think there is a strong possibility. I welcome any new series that explores healthy friendships between women. Next up will be "Petite Peche" Story 2! For those of you wondering about Bisco Hatori's newest series, "Urakata!!" , no, we will not be translating that series. I did read the first chapter and it did not capture me. It has shadows of "Ouran High School Host Club", but the main character is starting with too weak of a personality for me to like. Also, I imagine if the series runs more than one volume, it will be licensed based on the success of Ouran. Please keep the images relevant to Crimson Flower content. Also, if you grab images from an artist from site like pixiv or deviantART, please be sure to get permission from the artist.